Day 1. Istanbul; Arrival to Istanbul. After clearing customs, we will meet. Orientation tour, ancient city walls, Yedikule, Golden horn bay and transfer you to your hotel. We will have a briefing here and I will give you important information about this complete grand tour. Overnight in Istanbul, the unique city in the world to be located on two continents. Day 2. Istanbul; Early departure at 7.00 visit of the Hippodrome and Blue Mosque then continue to the Yerebatan underground cistern. Proceed to the Istanbul Archaeological Museum and see the Sarcophagus of Alexander the Great before visiting the Topkapi Palace. Our visit in the Topkapi Palace will be a full visit including the Harem as well. A nice view over Istanbul and a beverage will be available in the Palace. After the visit of Topkapi we will see the masterpiece of the Byzantine art, St. Sophia. The Grand Bazaar will be our next destination. We will also visit a baroque style mosque Nuruosmaniye, and a famous Second Hand Book Store Market Bajazet Mosque while wondering around the Bazaar. Day 3. Istanbul – Golden Horn; Departure at 7.30 Start the day by visiting the Suleimaniye Mosque another view of the monumental Classical Mosques. Drive to Yedikule Dungeons, see the wells which were filled by the heads of criminals. See also the dungeon where Sultan Osman II was drowned to death with a rope by Janissaries. Following the ancient city walls of the city proceed to Edirnekapi. In Edirnekapi, we will visit the ancient Byzantine church of St. Saviour in Chora. Drive to Eyup Kulliye consisting of an ensemble of monuments gathered around the Mausoleum of Eyup who was the standard-bearer of the Army of prophet Muhammad. After our visit to this very sacred place for the Muslims, we will climb to the old cafe of Pierre Loti through the old cemetery. At Pierre Loti you will enjoy a wonderful panorama over the Golden Horn bay, which is an inlet of the Bosphorus strait. Later on we proceed to Eminonu and visit the Egyptian Spice Market. In the end of the day we will go to the Military Museum to listen to the performances of a Janissary Band. Day 4. Istanbul – Bosphorus – Palaces – Ankara; This morning we will embark a cruise boat at 7.30 for a Cruise on the Bosphorus. Disembarking at Dolmabahce on the European side we will visit the Dolmabahce palace. After its construction in the second half of the 19th, century this palace became the main residence of the Ottoman Sultans until the end of the first world war which marked the end of the Ottoman Empire. A golden palace we should say with all the gold plated walls, ceilings, furniture and all the rest. More than 285 rooms and 43 halls, with paintings of the famous painters of the time, wonderful crystals everywhere and Hereke silk carpets reflect the wealth of the Ottoman Empire even at that period of full decadency. Our visit in Dolmabahce will include the Section of Concubines. Our next visit will be the Yildiz Emperial Gardens where we will have nice walk through the beautiful trees and flowers before we reach Yildiz Sale palace from the 19th, century. After this visit taking the highways of the Intercontinental bridge between Asia and Europe we will arrive to the Beylerbeyi Summer Palace built in the 19th century. In the rest of the day we will drive to Ankara. Day 5. Ankara – Cappadocia; This morning we visit the capital of Turkey. The city of Zeybeks, of those emancipated Dionysiacs who live only for their honour. Clearly the word Zeybek derives from Iobakkhi, Io Bakkhus the Roman name of the God of Vine Dionysus. In Ankara we will visit the museum of Anatolian Civilisations where you will have the chance to see the summary of the history of Turkey. Starting from the Palaeolithic, age, all important periods of the human being living in the ancient Turkey can be described in that museum. Objets, descriptions, pictures and frescoes all of them original, from the Neolithic, the Chalcolithic, the Early bronze age, are the first highlights to impress the customer. Continuing forward you will also see the Assyrian trading colonies period, the Hittite period, the Phrigian period, and the Urartian periods. After the visit of the museum we will visit the Mausoleum of Atatürk, who was the founder of the modern Turkish Republic in 1923. Later on we will proceed towards Cappadocia. After a drive of about 5 hours we will arrive to Cappadocia. We will overnight by a small Cappadocian village. Day 6. Cappadocia; Full day visit of Cappadocia the dwelling place of the first Christians. Many Christians who had been chased away from Jerusalem and from the places around Jerusalem, where they were living, came to Cappadocia for their safety. 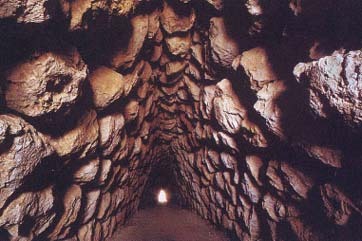 In Cappadocia they were able to dig caves, and protect themselves from their enemies. And they started to spread out the Christian religion from here. After the 4th century as the Christianity became an official religion throughout the roman empire they started to spread the religion by means of the pictures they draw on the walls of the churches they dug. In Cappadocia we will visit Avcilar village, the so called fairy chimneys which are strange looking rocks looking like chimneys or mushrooms, Zelve valley, and a Seljukian Caravanserai. Day 7. Cappadocia; After the breakfast at the hotel we will visit the underground city of Derinkuyu which having a depth of 85 meters, could accommodate about 2’000 families meaning roughly 10’000 people. We will continue to discover this amazing region. Kizilvadi, churches, monasteries and the Göreme Valley. Most of the rock dug, churches with beautiful frescoes are located in the Göreme valley. Christian monks living here were certainly very happy, as they were able to produce good wine from the vineyards in the valley. In Cappadocia we won’t miss the opportunities for visiting some local handicraft workshops and watching folklore shows in a special rock dug place where we will have chances for dancing and having a real party. Day 8. Cappadocia – Konya; Early departure for Konya. While leaving Cappadocia we will visit Ihlara Valley which will be on our way. A valley of unparalleled beauty. Later on we will visit a wonderful small town called Guzelyurt. Later on we will proceed to Konya via Aksaray. Konya was the ancient capital of the Seljuk Empire, the first Turkish empire founded in Asia Minor. In Konya we will visit the monastery of Mevlana from the 13 th century. Mevlana 1207-73 was a poet, scholar, and philosopher and the founder of the order of whirling dervishes who while performing their dance consisting of turning around themselves, were getting closer to God. Overnight in Konya. Day 9. Konya – Pamukkale; Today before we leave Konya we will go the Karatay Medrese which is an ancient university dating from the times of Seljuks. Then we will leave Konya to proceed to Pamukkale. In Pamukkale we will visit the water cascades and the ruins of Hierapolis above. Before we have a bath in the magic waters of the ancient Hierapolis. Overnight in Pamukkale. Day 10. Pamukkale – Termessos – Antalya; We will leave early in the morning to go to Aphrodisias. The city of love of Aphrodite where any kind of obscenities were tolerated by legislators. In Aphrodisias which is one of the most important archaeological sites of Turkey beside the temple of the Goddess of love Aphrodite, we will see a very beautiful Odeon and a magnificent stadium which is the best preserved in all of Turkey. We will continue our way penetrating in to the mountain chain of Taurus. In this beautiful region of Turkey which is called “region of lakes” still live nomads and today we will eventually make a stop by a nomadic village. After having passed the small town of Korkuteli we will start climbing a snaky road which will take us to an extraordinary site in the mountains, Termessos. This antique site situated at a height of 1050 meters offers to the visitors a wonderful view on the Mediterranean through the Taurus mountains. Watch out for the wild goats around. Overnight in Antalya. Day 11. Antalya – Perge – Aspendos – Gulette; This morning we will first visit the museum of Antalya which holds the most beautiful statues and objects found during the archaeological excavations carried out in the area. After the visit of the museum we will proceed to the water falls on the way of Lara beach. The view of the waterfalls at that area called Karpuzkaldiran meaning watermelon lifter is wonderful. Later on we will proceed to Perge another ancient site very interesting having a charisma of its own. Later on we will go on further towards east and discover the beautiful theater of Aspendos. The best preserved Roman theatre of the antiquity. After this visit we will return back to Antalya, to the pier where we will embark our yacht to start an Odyssey on the Turquoise coast. With all our provisions on board. Our first stop will be Phaselis, a marvellous antique site on the ancient Pamphylian region hidden under the pin trees. Day 12. Phaselis – Olympus – Finike – Gulette; Pulling anchor and heading towards the ancient city of Olympos, on the southern side of Mt. Tahtali (Mt. Olympos). Oleander and laurel bushes shade the Olympos Valley, which we will be able to approach by sea. Nearby at Yanartas (at a height of 300 meters), according to mythology the Lycian hero Bellerophon, mounted on his winged horse Pegasus slew the fire-breathing monster, Chimaera. Gas which seeps from the earth burns brightly at night. The Byzantines also considered this place a religious area. Tonight we will put anchor nearby Finike. Day 13. Finike – Kekova – Kalkan – Gulette; Today we will set sail early in the morning and we will navigate towards Myra. St. Nicholas known also as Santa Claus or Father Christmas was a native of this land. He was the archbishop of the Metropolitan Church of St. Nicholas in Myra where he died in the 4th, century. We will step ashore for a while to visit the church of St. Nicholas and Myra. Our Odyssey will continue along the shores of Kekova Island, earthquakes caused the land together with some of the ancient houses to sink under the crystal clear water, creating a sunken city. Mythological mysteries, and the legends told about the pirates are quite interesting to hear. Later on we will cruise around the bays providing natural harbours in every season. We will arrive to Kalkan in the afternoon. Kalkan, is a lovely small hilltop town that overlooks a tiny bay. Narrow, winding streets lined with souvenir shops lead up from charming marina to the hill. As the sun sets you can enjoy a relaxing drink before a light dinner with all kinds of best fruits you wish to have. You certainly will enjoy a relaxing promenade in this charming small town. Day 14. Kalkan – Gemiler – Gulette; Pulling anchor early in the morning, we will set sail to have another wonderful day on board of our gulet, and we will have opportunities for swimming and relaxing. You could possibly see some dolphins. Today we will also have time to step ashore and visit Xanthos, ancient capital of the Lycian region. There were times Lycia was invaded by enemies and brave Lycians twice demonstrated their strong desire for independence by choosing mass suicide rather than surrendering to the invading forces. A poem found here on a tablet reminds this tragic story of the heroes of the town. In the evening we will moor by a small island called Gemiler. Day 15. Gemiler – Fethiye – Gocek – Gulette; Today we will sail towards Gocek and wonder in the gulf of Fethiye. We will make stops for swimming and visiting fascinating small islands in the Gulf. The Turquoise Coast is offering graciously its magic beauty and charm here. The crystal clear, deep waters change from the palest turquoise to the darkest blue, and the coastline is thickly wooded with trees, bushes and flowers everyone of which is a remedy for a disease. At the end of the day we will arrive to Gocek, which is a picturesque small village on the Mediterranean set in a beautiful pine forest. Day 16. Gocek – Kaunos – Marmaris – Gulette; Our last stop will be at Dalyan, where we will take a smaller boat excursion on the Dalaman river for a remote discovery of the area. We will see Kaunus, and the fascinating rock carved Lycian style tombs. The golden sand beach which is at the mouth of the river is an endangered loggerhead turtle conservation area. During this visit our mission will be to collect any possible litter which might be found on the beach. We will finally arrive to the port of Marmaris where we will disembark. It is nice to touch the foot to the ground after so much time spend on the seas. Tonight we will be in a first class hotel in Marmaris. Day 17. Marmaris – Bodrum; We will make an early departure to Bodrum ancient Halicarnassus. After we arrive to Bodrum we will visit the remains of the tomb of King Mausolus. The Mausoleum which was one of the seven wonders of the world was built by his widow Artemisia. After this visit we will proceed to the fortress of the Knights of St. John of Jerusalem, which houses today the unique underwater archaeological museum of Turkey. The towers of the fortress offer a wonderful view of the town and the sea. This evening we will have a promenade in the streets of Bodrum. This singing, dancing, swinging town with its Mediterranean ambience is a dwelling place of artists, celebrities and intellectuals of Turkey. Overnight in Bodrum. Day 18. Bodrum – Miletus – Priene – Ephesus; Early Departure to visit Priene and Miletus two fantastic Ionian cities mentioned by Heredotes. Millet which was a brilliant metropolis of the Ionian region was also the cradle of philosophers and mathematicians like Thales, Anaximenes, Anaximander, Hippodamus. In Priene we will see a Greek style theatre which is known as the best preserved original Greek style architecture theatre of the world as during the following Roman and other eras has not been modified much. In the afternoon we will continue towards Ephesus and we will visit the house of the Virgin Mary situated at the heights of a mountain. Overnight in Ephesus. Day 19. Ephesus – Pergamon; We will leave early in the morning for the visit of the ruins of Ephesus, a great ancient city of an extraordinary beauty. Famous around the world for housing Artemis Temple which was one of the seven wonders of the world during the Hellenistic period. Later on we will visit the Basilica of St. John built on the tomb of the renowned disciple of Jesus Christ. To complete the visit of Ephesus we will also see the Archaeological museum located in the nearby town of Selcuk, before we make our way to Pergamon. Bergama which holds actually the ruins of the capital of the ancient Pergamon Kingdom is a provencal town of approximately 50,000 inhabitants. Overnight in Pergamon. Day 20. Pergamon – Troy – Canakkale; This morning we will climb to the Acropolis of Pergamon where we will see the ancient city walls, the Hadrian and Apollo Temples, the remnants of the famous library which contained manuscripts made of Parchment paper, the unusual Greek style theater which resembles to an eagle nest, the little tiny temple of Dionysus located nearby, the promenade alley and the remnants of the Zeus Temple which was one of the seven wonders of the world during Hellenistic period and more. Later on we will proceed to the ancient medical center Aesculapion where patients were healed by natural methodes and medicines. This visit to Aesculapion will make us understand how much the good morale and the natural medicines could be important and could save human lives. After this visit we will proceed again towards Ayvalik. Following up towards north olive trees along the right side of the road and the Aegean sea on the left will be our main panorama all the way up to Troy located at the south of the Dardanelles. A strait which has been a key point during the World War I. After having listened to the stories of the Trojan war we will make our way to Canakkale. A charming quite town situated on the Dardanelles. Overnight in Canakkale. Day 21. Canakkale – Istanbul; Today we will take a ferry to get to the European side of the Dardanelles and will visit the battle fields of Turkish and Anzac troops. We will see the local museum, the Anzac Cove, Lone pine, Chunuk Bair and the trenches where some of the bloodiest wars of the world took place. We will drive to Istanbul in the afternoon. Check in to the hotel and have a rest. Day 22. Istanbul Princess Islands – Ankara; Today is the day we will visit the Princess Islands and take a horse carriage tour there. We will drive to the Asian side and take a ferry. In the afternoon we will drive to Ankara and overnight here. Day 23. Ankara – Amasya; We will depart early in the morning and proceed to the Hittite capital Hattusas. We will visit the big temple, the city walls with it’s famous Lion’s Gate, Underground Gate and King’s Gate, The big Palace and of course the Yazilikaya open air temple 3 kms from there. In Yazilikaya you will see most of the famous Gods of the Hittite Pantheon. The Sky God known as Teshup in the old Hurri religion probably representing the king Hattusili 3rd is standing next to Arinna’s Sun Goddess also known as Hepatu in the old Hurri religion a Goddess who strongly influenced Anatolia earlier long before Hittites came from Caucasus. This Goddess who possibly represents the Queen Puduhepa, wife of Hattusili 3rd is stepping on a Panther here. King Tudhalia IV and other Gods and Kings are nicely depicted on the facades of the rocks of the Yazilikaya openair temple of this Megalithic civilization of the ancient times. After our visit of Hattusa we will proceed to Amasya and overnight in this beautiful town located on both sides of Yesilirmak river. In this beautiful town we will visit the rock carved tombs of the ancient Pontus Kings and some old Ottoman buildings. Day 24. Amasya – Ordu – Giresun – Trabzon; Today is the day we will drive along the beautiful Black Sea region. After Samsun we will make a short break by the Black sea before we proceed to the famous Jason’s place of Argonauts. Driving along the hazelnut grooves we will reach Trabzon we will check in and go for an orientation tour in the town late in the evening. Day 25. Trabzon – Sumela – Trabzon; Today we will visit the famous Sumela monastery built high in the mountains by Christian Monks in the 4th century. Standing on a high cliffs of the Golden Valley this monastery will be one of the most remarkable sites of your journey in Turkey. On our way back to Trabzon we will continue our visits in the town. The ancient church of St. Sophia with characteristic frescoes and Ataturk’s house with very unique style on the heights of the town are definitely worth of attention. Day 26. Trabzon – Erzurum; Today is the day we will proceed towards Erzurum. A city founded at an altitude of 6233 feet above the sea level. This town which has so many beautiful architectural monuments of the Seljuk and Ottoman Empire periods will be also one of the unforgettable places of your journey. Yakutiye, Double Minaret School and Great Mosque from the 12th century all with a stylish architectural compositions with the healthy climate of this high mountain city is delighting the visitor. Today we will overnight in Erzurum. Day 27. Erzurum – Igdir; Visit of Erzurum. The ancient school of Yakutiye, Ulucami one of the oldest mosques of Turkey the ancient Ince Minaret school and we will proceed for Igdir located on the outskirts of the Mountain Ararat. The highest mountain in Turkey mentioned in the Bible as the grounding place of the Noah’s Ark at the end of the deluge. Overnight in Igdir, a town situated at the slopes of the Ararat mountain. Day 28. Igdir – Dogubeyazit – Akdamar – Batman; Early departure in the morning for Dogubeyazit situated at the other side of the Ararat mountains, close to the Iranian border. After Dogubeyazit we will climb approximately 4 miles towards the mountain to reach Ishakpasa Palace. The palace which bears the influences of the Iranian, Ottomanne and Armenien offers a magnificent view from the apartments of the concubines section which look to the valleys underneath. Later on we will continue towards the Lake Van the biggest Lake of Turkey. After we pass the small town of Muradiye we will stop by the lake to take smaller boats to go to the Akdamar Island where we will see a church with beautiful relieves on its outer walls. We will have some time to swim in the Lake before we make our way to Batman where we will overnight. Day 29. Batman – Urfa – Harran – Urfa; Early departure for Urfa, ancient Edessa, so called city of prophets. The prophet Abraham was born in a cave in Urfa and it is in the same town that he was thrown in to the fire on the order of Pharaoh by means of a catapult built in between two columns which can be seen above on the hill overlooking the downtown and the holy carp pool. It is believed that when Abraham was thrown in that fire the fire turned in to water and the burning wood pieces in to carps. This is why the carps of that widely spread pool are holy. After the visit of the holy carp pool we will visit the market place of Urfa. Walking in the streets of this old town which has a totally oriental ambience will be a marvellous experience for our travellers. In the afternoon we will drive to Harran. Harran is another Biblical site archaeological site. It is the place where Jacob met his future wife Rachel nearby a well as he arrived to this holy city of her mother Rebecca. The castle, an ancient university and the beehive houses are among the most interesting parts to see in Harran. After this visit we will be on the flat plateau road again built on the fertile agricultural plateau of Harran irrigated by the Ataturk Dam at the north. Overnight in Urfa. Day 30. Urfa – Nemrud – Gaziantep; Drive to Kahta. On the way we will visit the dam of Ataturk. From Kahta we will take mountain minibuses to go to the mound Nemrud where the tumulus of the Kommagene King Antiochus 1st, is located. The visit of this monumental tomb at the top of a deserted mountain surrounded by the colossal statues of Anthiochus, Gods and divine beings will be the last most impressive site of our tour. Later on we will proceed back to Kahta from the Arsemia road. On this way we will see the ruins of Arsemia, the Roman bridge of Cendere, and the tumulus tomb of Karakus. Later on we will proceed to Gaziantep which is a well known South Eastern town especially famous for its pistachios of good quality around the world. Overnight in Gaziantep. Day 31. Gaziantep – Istanbul; From here you may either fly to Istanbul or continue your journey with me back to Istanbul. End of my services.